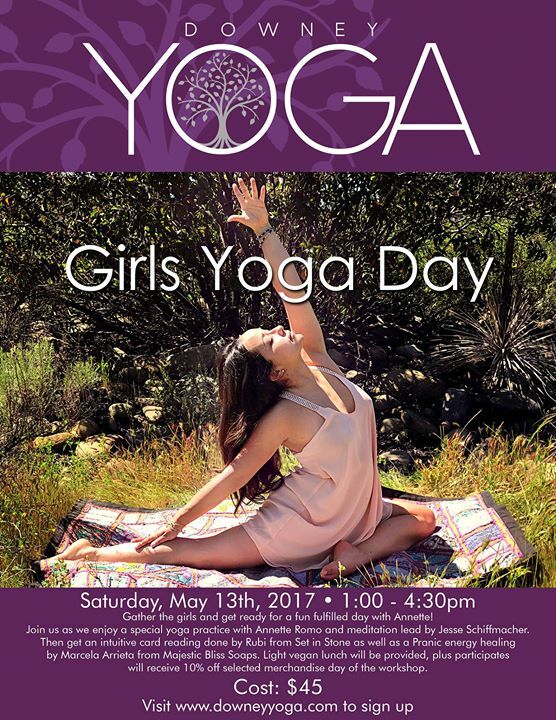 Grab your girls and join in on the 2nd Annual Girls Yoga Day Workshop! The day kicks off with an all-levels yoga flow lead by me, followed by meditation lead by Downey Yoga's Jesse Schiffmacher. Light vegan lunch will be served. Optional activities include Intuitive Card Readings by Rubi of Set in Stone and a Pranic Energy Healing by Marcela of Majestic Bliss Soaps. Bring your mat, water bottle and your best girl friends! Mothers-to-be are also welcome. No yoga experience needed. Minimum age is 14 years old. Rental mats available (limited supply). Purchasing tickets before event is encouraged. Event will sell out! Additional questions? Contact me at annetteromo@icloud.com.